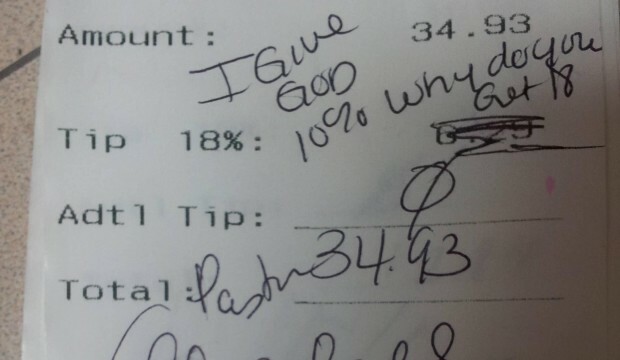 An Applebee waitress has been fired after taking a photo of a pastors tip, on which the pastor wrote “I give God 10%, why do you get 18%?”. If you are unaware, Applebee’s automatically adds a 18% server tip if the table has more than ten people. In this case, it did, and the payer had to give 18% to the server. The pastor clearly wasn’t happy with this idea and decided to voice her opinion on the bill. Chelsea, the waitress, posted the bill onto Reddit, in the sub-Reddit section /r/atheism. The bill quickly skyrocket and went viral all over the internet, with a lot of social media channels discussing the bill. It gained 3800 points and over 4500 comments on Reddit. Chelsea, the waitress, won’t feel too bad though, with a lot of companies now offering her placements and many offering financial aid until she gets a new job. It seems the Reddit atheist group and other people affected by this want to help the waitress get back on her feet. Meanwhile, the Pastor, Alois Bell, said “My heart is really broken…I’ve brought embarrassment to my church and ministry.” clearly she feels her actions were wrong, now that a lot of the Reddit community has seen it. This is yet another incident of how those little details can go viral and harm a persons’ life, for Chelsea it may have paid off, she will probably be getting offered placements in much luxurious positions, but for the pastor, her reputation in the community may be fickle now.